Oooh finaly a normal animated obi an! 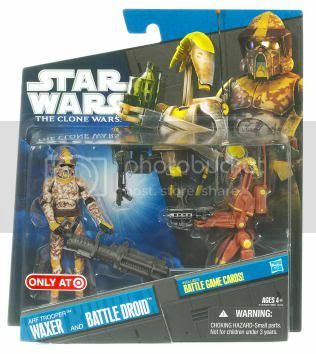 I will be defenatly getting that one as well as ahsoka's astromech! Well, that's not a normal animated Obi-Wan, if you mean it is just an animated version of how Obi-Wan appeared in ROTS. If that is what you mean, keep in mind he still has his forearm armor. This will still be a Clone Wars-specific Obi-Wan. I am stoked that we are getting an SA Cad Bane, and we are getting Hevy in his training gear. I will pass on the astromech. Well i didnt likr the original Obi-wan... it looked weird.. and i have the one in space gear and im glad that they have one now with the jedi tunics dispite the forearm armour... and i like the astromech droids colours, ive yet to get a clone wars version one. These should be some great figures the new Obiwan looks much better with his ROTS style robes and a new updated Cad Bane with Todo 347 I think it is. The new astromech looks great and the Hevy looks amazing all buys for me! Me likey the new Obi-Wan. Can't wait to see it in person. 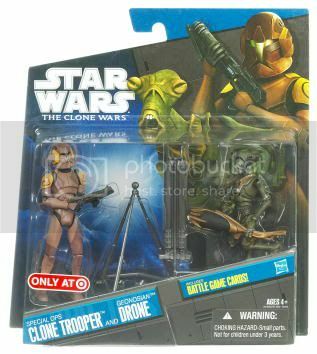 We have a list of the 2011 Clone Wars figures from Walmart's computer. I figured that, but first or second quarter? I would say that this list constitutes the first half of the year. I won't be fully satisfied until I see Master Di on that list.